The Chinese government imposes heavy censorship on internet use within the country. These restrictions are known collectively as China’s Great Firewall, and they present a real problem to travelers and expats staying or living in China. However, you can bypass the Great Firewall with a Virtual Private Network (VPN) like ExpressVPN. Today, we’ll explain Chinese internet blocking in more detail, and show how to use ExpressVPN safely in China. Internet censorship is nothing new; most countries block access to websites that host illegal material, for instance. That said, China’s restrictions are numerous and far-reaching. Social media sites and messaging apps like Facebook, Instagram, Twitter, and WhatsApp are blocked, so it’s hard to stay in touch with friends and family in other countries. Further, with dissenting opinions readily quashed online and major western news sites inaccessible, it’s extremely difficult to find unbiased information about the wider world. There is a workaround though: by signing up to a working VPN before you travel, you can beat China’s Great Firewall and access blocked sites. These services work by encrypting your traffic and routing it through international server networks. The benefits are twofold: you gain access to sites which are usually blocked in China and your activities become almost impossible for your Internet Service Provider (ISP) or the government to monitor. 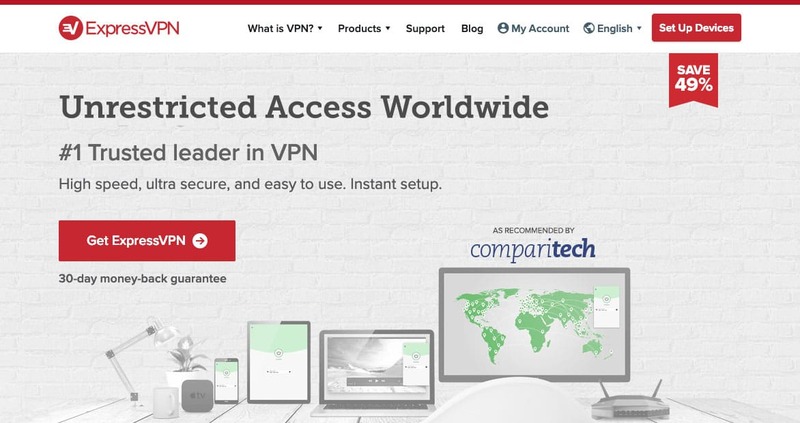 How can ExpressVPN beat Chinese internet restrictions? Although most VPNs no longer work in China, ExpressVPN still does. This provider doesn’t have any servers in China, so it doesn’t have to monitor its user’s activities or comply with other aspects of Chinese data-retention legislation. Additionally, this makes it far less likely that the service’s hardware will be bugged by government operatives. Sadly, this isn’t a fringe conspiracy theory and it happened recently to Apple and Amazon servers. Why use ExpressVPN in China? ExpressVPN is a strong choice for users in China for numerous reasons. Firstly, it’s very fast and offers access to more than 2,000 servers across 94 different countries. Second, it has excellent multi-platform support, and even includes custom firmware to make installing it on network routers as simple as possible. This service takes your security seriously. It uses 256-bit AES encryption, perfect forward secrecy, and protection against DNS, IPv6, and WebRTC leaks to keep your activities private at all times. There’s also a kill switch (desktop only) that immediately stops all traffic if your connection drops suddenly. Best of all, ExpressVPN doesn’t log any personally identifiable information. It even allows you to pay in Bitcoin for increased anonymity. GET EXPRESSVPN FREE: Usually, VPNs save their lowest prices for users willing to commit to a year or more upfront. However, if you only need short-term coverage, you can use ExpressVPN’s 30-day money-back guarantee instead. This does require an immediate payment, but you can cancel at any point to get your money back, effectively allowing you to try it for free. One of the best things about ExpressVPN is that there are no special steps required to connect in China. Just choose your preferred server as normal and you should be able to browse the web freely. However, the ExpressVPN website is currently blocked in China. As a result, we strongly recommend registering and installing the service before you travel to the country. Because China monitors its citizens’ internet access so closely, there are a couple of steps we recommend taking before you connect for the first time. 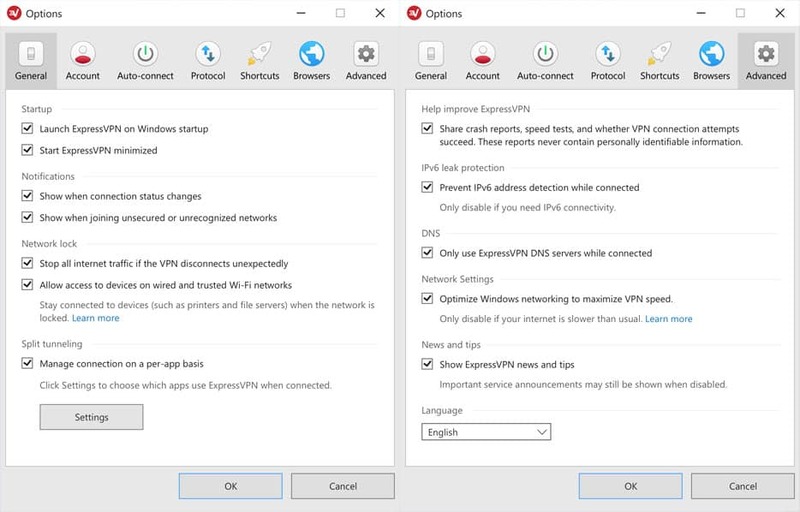 To begin with, we’re going to make sure ExpressVPN automatically connects your device to the VPN whenever it’s turned on. From the main page, click the menu icon (three lines) in the top-left, then choose Options. Under the General tab, enable the first two options. This will ensure you never accidentally browse without protection. If you’re using a desktop version of the app, we also recommend enabling Stop all internet traffic if the VPN disconnects unexpectedly. Next, move across to the Advanced tab and make sure the IPv6 leak protection and DNS options are checked. When you’re done, click OK.
Now you’re free to connect as you normally would. To do this, return to the home screen and click the large button in the middle. This will automatically connect you to the best server for your current location. You can also choose a specific country to connect to by clicking the Choose Location button, and picking one from the list on the right. Why does China restrict the internet so heavily? In theory, China’s internet restrictions are supposed to protect citizens from material that could corrupt, divide, mislead, or incite hatred. The problem is that ideas are open to interpretation but only the Chinese government gets to decide which content falls under what category. As such, the Great Firewall is regularly used as a tool to silence political opponents and those with dissenting opinions. It doesn’t help that the relevant legislation (Computer Information Network and Internet Security, Protection, and Management Regulations, 1997) is ambiguously worded and seems designed to give the government as many ways as possible to censor content. For example, anyone who posts content critical of the government (even if it’s a balanced news article) could be guilty of “inciting division,” “openly insulting other people,” “injuring the reputation of state organs,” or “activities against the constitution.” Further, with rumors forbidden entirely, even lower-stakes activities like discussing celebrity news online could be considered a crime. What kind of services are blocked in China? Do any other VPNs work in China? The Chinese government has put a lot of effort into stopping VPNs from providing a way around their internet restrictions. Further, we’ve heard from some services that local ISPs are blocking them of their own accord. As such, there aren’t many VPNs that still work in China, and even fewer that are reliable. Currently, the only services that we know work reliably in China are ExpressVPN, NordVPN, Ivacy, StrongVPN, and VyprVPN. However, as the main website for each of these services is currently blocked, you’ll have to find a working mirror site in order to sign up when in China. As these mirrors can also become inaccessible, we strongly advise you to register before visiting the country. Can I check whether a specific site is blocked? We actually have a Great Firewall tool that enables you to check whether a given site is currently blocked in China or not. It’s worth noting that China’s restrictions are frequently updated, though. This means that even if a website is currently available, it may not be by the time you arrive. What should I do if my VPN’s site is unexpectedly blocked? If you’re in China and suddenly find yourself unable to connect to your VPN or access your provider’s website, the only real course of action is to wait and see if the service comes back online. That said, there are a few steps you can take in advance of your trip to reduce the chance of being left stranded. 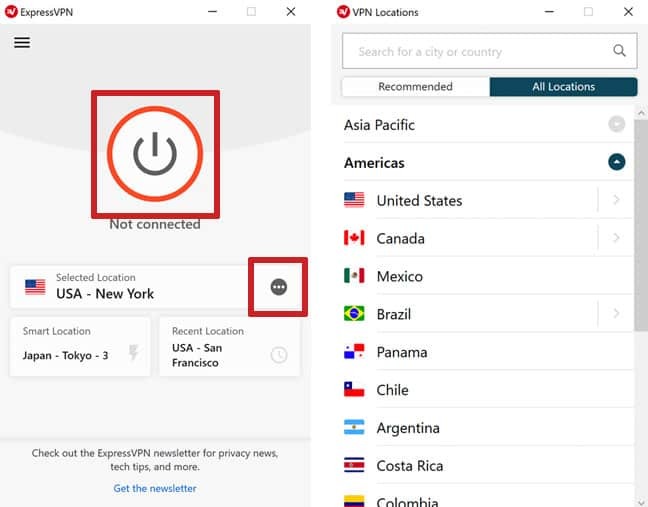 Although ExpressVPN and the other services listed above work reliably in China, we recommend keeping a note of your VPN’s mirror sites, support email addresses, and manual configuration instructions for your device, just in case. You’ll be unable to access anything stored in the cloud, so it’s best to keep a copy of this information on a password-protected device. Access to VPNs is heavily restricted in China, but the technology itself isn’t illegal. For instance, the country allows businesses to choose from a list of pre-approved local VPN providers so they can work with international employees. VPN Express works in China but is the slowest thing you can imagine. My normal speed without VPN Express is around 60mb with VPN Express im lucky if Im able to connect to any of thier working servers, usually can take up to 20 minutes. So the speed, it drops to 1,5 to 6mb normally… from 60!!!!! and when you contact them it is a nonesense… I dont recommend it.